SH7760 7040. The square-shaped earthworks of Caerhun (Canovium) Roman fort are located about a quarter of a mile east of the hamlet of Caerhun and along a lane that leads off the B5106 Conwy road east of Tyn-y-Groes, about 5 miles south of Conwy. The lane is signposted to St Mary’s church and actually goes through the south-west corner of the fort in order to reach the church. The Romans built their temporary wooden fort with an earthen rampart and two ditches close to the west bank of the Afon Conwy (River Conwy) in 75 AD and, later in about 150 AD, they rebuilt it with stone. The 13th century church and churchyard of St Mary now occupies the north-east corner of the fort’s earthwork rampart. In 200 AD the fort was destroyed but it seems some form of occupation occured in the 4th century, only to be completely destroyed in c400 AD. After that there may well have been Romano-British occupation when a 5th or 6th century prince or king of Gwynedd called Rhun set up a camp or settlement here. Did Rhun found the first church on this site? Caerhun (Caer Rhun) takes it name from him. Canovium’s earthwork ramparts are visible, especially at the south-side and at the south-east side of the churchyard, but can be better seen on aerial photographs of the area. The fort measured 140 metres by 80 metres . Crop marks within the defenses mark where the buildings were situated, but the bath house stood outside the fort just to the west of the church – the earthworks from this are still visible. In 1926-9 archaeologists excavated the site and discovered a docking facility down by the river with signs of a jetty there. They also found Roman pottery, coins, a small stone with an inscription recalling the 10th legion (Leg.X), and possible remains of a villa. Obviously the fort occupied a strategic position with the Roman road heading north to Segontium (Caernarvon), a major military fort, and Deva (Chester) to the north-east; the river just to the east of Canovium would have been a bridgehead that was well defended by the local garrison. St Mary’s church dates in part from the 13th century, especially the side-walls of the nave, but mostly it is a 16th century building. 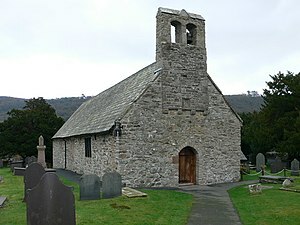 Monks from Maenan abbey are thought to have built the church. The east window is thought to be from the original church. In 1972 fifteen bones, three skulls and a child’s pelvis were discovered by the north wall where an ancient water stoup is now built into the wall close by the west door. Outside, a small square-shaped medieval stone showing Christ crucified is built into the wall. Some of the stones from the Roman fort are incorporated into the walls of the church. All in all a very nice little church, in fact, the whole site is well worth a visit, even though not much of the Roman fort survives today. Categories: Caerhun Roman Fort, Roman Sites | Tags: Caerhun Roman Fort in Caernarvonshire Wales, Roman Sites | Permalink. You said the fort was originaly built in wood and then replaced with stone at a later date. Is there any evidence that the first church was built with reused Roman stone as has often been the case elsewhere? Hi Barry, yes there is Roman stone in the church walls. Forgot to put that in the article. Will try and fit it in. Thanks.